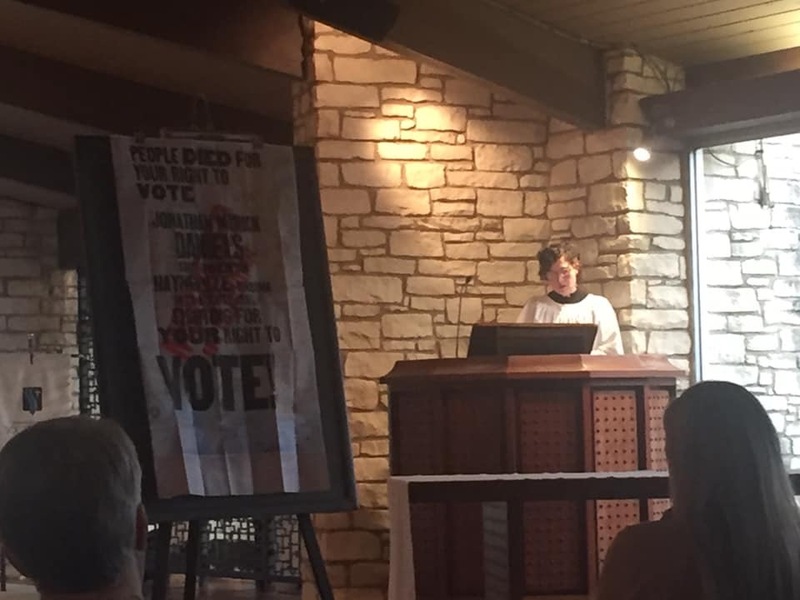 Corrie Cabes, a postulant for Holy Orders in the diocese, preached at the Jonathan Daniels Evensong service on Tuesday, February 5, at Christ Chapel at Seminary of the Southwest in Austin. Drew Brislin from Diocese of Alabama led the service. Cabes’ sermon centered on a conversation with The Rev. Judy Upham about her experience during the Civil Rights movement in the 1960’s and particularly about knowing Daniels and serving alongside him. The service included a stirring hymn (#165) from the Life Every Voice and Sing hymnal and the Magnificat on S-185 in the hymnal. The Magnificat inspired Daniels, calling to him, to focus on serving God through serving others. Lectors read portions of Outside Agitator by Charles W. Eagles. The readings gave the service a feeling similar to a passion play…taking participants from the beginning of Daniels’ ministry to his murder in 1965 by segregationist Tom Coleman.